Before retiring from employment with the University of Sydney in early 2016 the author contributed to an options paper on the regulation of Electronic Nicotine Delivery Systems commissioned by the Department of Health, Canberra. He wrote a first draft of a section on their use in smoking cessation. In 2012, in the early days of the rise of e-cigarettes, Kingsley Wheaton, Director of Corporate and Regulatory Affairs at British American Tobacco, said “Our core business is, and will remain in, tobacco”. So have the intervening four years made much difference? Apparently not. In 2014, more than one billion smokers spent some $US744 billion on 5.6 trillion cigarettes. By contrast, the global e-cigarette market had estimated sales of $US6.1 billion in 2015 (0.8% of the cigarette market). Bullish forecasts about the future of e-cigarettes are easy to find on the internet. Many of these are undoubtedly efforts to attract investors. But recent data point to a major slowing in the growth that has been seen in some nations for about five years. In the important US convenience store sector, sales of vapour products fell continuously for seven months (note that this data does not include online or vape shop sales). Western Europe – for the first time in several years – saw positive [tobacco] volume growth as economies recovered and out-switching to illicit and vapour products lessened. Barth highlighted three high-growth segments for cigarettes: low-tar cigarettes, which Motley Fool noted “have become an important way that some smokers have aimed to address their concerns about potential health impacts of smoking”; slimmer cigarettes (a strategy usually targeted at women); and the capsule market, where smokers can burst a capsule of flavour embedded in the filter. Low-tar cigarettes have of course been thoroughly discredited as false and misleading harm-reduced products. The Australian Competition and Consumer Commission (ACCC) has banned the light and mild descriptors in Australia. The tobacco industry knew about this deception for decades (see below) but is apparently still happy to benefit from and not actively correct consumer misunderstandings here. In recent years we have seen an incontinence of rebirthing talk from Big Tobacco companies such as Philip Morris, British American Tobacco (BAT), RJ Reynolds and Japan Tobacco International about their commitment to manufacturing non-combustible nicotine delivery devices, particularly e-cigarettes and Philip Morris’ heat not burn products. The hope for these products, like a conga line of hyped harm-reduction failures of the past, is that they will significantly reduce disease and death from what follows from nicotine addiction. Tobacco companies of course all wish that two in three of their very best customers didn’t inconveniently die from using their products years earlier than normal life expectancy. They would much rather they could all keep smoking for a normal life span and keep the cash registers turning over. For decades companies just denied that smoking killed. In the 1990s, these lies were stopped in their tracks when the companies were forced to publicly swallow truth serum in the form of their own newly public internal documents, released via whistleblowers and through litigation. These showed they knew the problems with tobacco all along. If the industry really cares deeply about the deaths of its customers, this care is not enough to do anything to stop it selling the deadliest forms of nicotine delivery, nor to desist from its major attacks on tobacco-control policies it knows are most effective in reducing smoking. Plain packaging, which started in Australia, continues to attract massively funded attacks and legal challenges, currently in full swing in Canada which is nearing legislation. Every day British American Tobacco’s twitter feeds around the world are choked with its best efforts to demonise tobacco tax rises, all in the hope that governments will reduce tobacco tax. This would see both smoking and the diseases it causes rise. The very last thing that Big Tobacco hopes for harm-reduced nicotine products is that they will cannibalise their mainstay cigarette markets. Instead, the business model is dual use (people smoking where and when they can smoke, and vaping when they can’t); luring ex-smokers back as customers with promises of negligible harm from vapoursied nicotine products; and intriguing young people who have never used any nicotine product and who are increasingly never likely to, to start experimenting with vaping and hopefully doing it regularly. 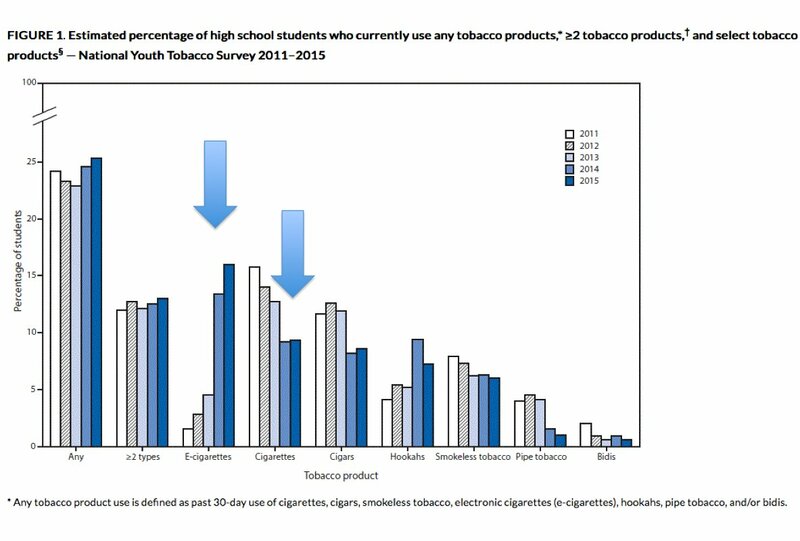 In the United States, the latest National Youth Tobacco Survey shows the historically continuing fall in youth smoking has come to a screaming halt coincident with record use of e-cigarettes. The anxiety in the tobacco industry about this must be all-consuming. There is now a small group of experts in public health who are now openly or covertly collaborating with the tobacco industry over e-cigarettes. They are being comprehensively played. In mouthing its newfound concern for tobacco’s harms, the industry’s harm-reduction division personnel can now cosy up to a suite of naïve or historically amnesic public heath urgers who lend Big Tobacco a credibility it craves. Meanwhile, down the Big Tobacco corridor in the cigarette divisions, the harm-reduction staff’s colleagues continue promoting smoking and attempting to thwart effective tobacco control as usual. This new, embarrassing and appeasing embrace is rather like charity leaders warmly embracing a mafia boss for his generous annual cheque, knowing full well from where the largesse was derived.